The 2017 Gris Gris Guide to Mardi Gras in Shreveport-Bossier. Photo by Chris Jay. 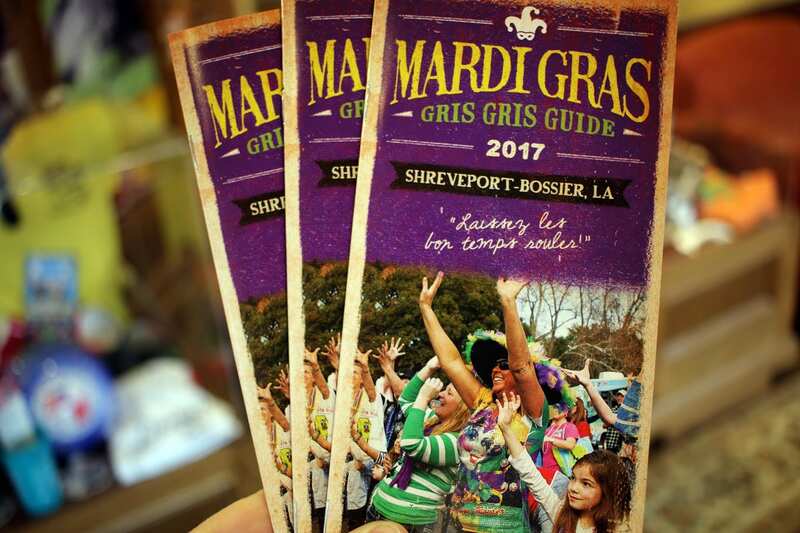 The Shreveport-Bossier Convention and Tourist Bureau has released the 2017 edition of The Gris Gris Guide to Mardi Gras in Shreveport-Bossier, a free annual publication that serves as a comprehensive guide to Mardi Gras season in Shreveport and Bossier City. The 18-page guide can be picked up in person at 629 Spring Street in downtown Shreveport, downloaded at www.Shreveport-Bossier.org/MardiGras or requested by mail by calling 800-551-8682. The Gris Gris Guide takes its name from a term used to describe a Voodoo charm or spell that is believed to bring the wearer or recipient good luck and joy. Shreveport-Bossier is home to the largest Mardi Gras parades in North Louisiana, with an estimated combined total of 570,000 attending its two largest parades – the Krewe of Centaur and the Krewe of Gemini – in 2016. Major event dates for 2017 are: The Krewe of Centaur Parade XXVI, 4:30 p.m., Feb. 18; The Krewe of Barkus and Meoux Pet Parade, 12 p.m., Feb. 19 at Events on the Red in Bossier City; The Krewe of Gemini Grand Parade XXVIII, 4 p.m., Saturday, Feb. 25 and The Krewe of Highland Parade XXII, 1 p.m., Sunday, Feb. 26. With a total of 13 Mardi Gras krewes based in Shreveport-Bossier, there are also a variety of smaller parades, parties and events planned in addition to the major parades. Information on all of these events can be found in The Gris Gris Guide. For much more information on Mardi Gras in Shreveport-Bossier, including special hotel offers, helpful parade route videos, giveaways and more, visit www.Shreveport-Bossier.org/MardiGras. To plan your visit to Shreveport-Bossier, head to www.Shreveport-Bossier.org or call 800-551-8682.